"Good evening, I’m Harry, nice to meet you, thanks very much for coming," he smiled. "How are you? Good! Thank you very much for coming tonight. I’ve always wanted to play the Troubadour and I’m here, so that’s cool." He continued, amid cheers, "My album came out last week. Thanks! I liked it as well. I’m going to play the songs from that and a few other things. Tonight is already really the best night of my life, so thanks so much for being here." Otherwise he kept his banter minimal though he did respond to one particularly excited fan who shouted, "Show us yer t**s!" Without missing a beat, Harry laughed, "It’s still too early and I haven’t had a drink." He then played Stockholm Syndrome before introducing his surprise special guest. "I’m pretty sure that this was going to be up there with one of the best nights of my life," he noted. "If there was any doubt, I’m pretty sure I’d like to confirm, in my entire life, I never thought I’d be able to say this: Please welcome to the stage, Stevie Nicks." 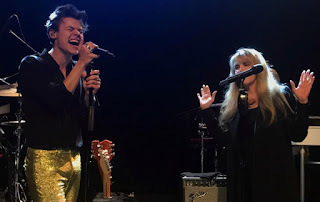 The unlikely superstar pairing - she's 68, he's 23 - duetted first on Harry's song Two Ghosts, which saw the heartthrob getting emotional, then Fleetwood Mac's iconic song Landslide. They then sang together on Stevie's solo hit Leather and Lace. 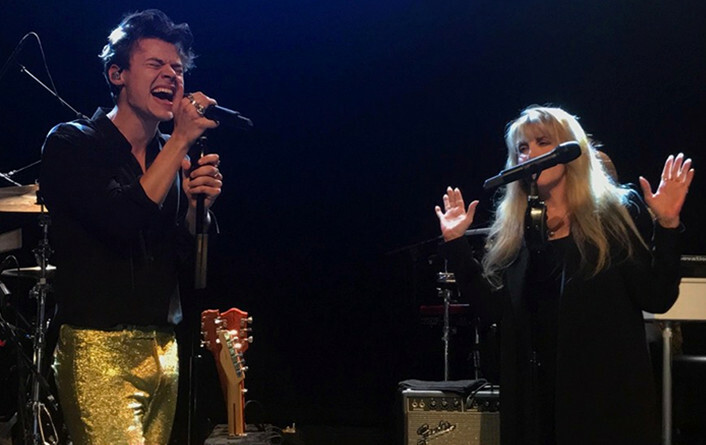 Clearly a fan of Harry's, Stevie said after their rendition of Two Ghosts, "It's a great song, huh?" Announcing the end of her guest spot, Harry couldn't stop smiling as he said, "She’s the queen of anything," and literally bowed to the rock icon. He concluded his set with current hit single Sign of the Times. "Thank you so much for being here," he shared before leaving the stage. "Thank you so much for listening, playing, I love you very much and I will love you forever. Thank you for being here. You’re all wonderful, I hope to see you very soon." Harry also played a secret show on Wednesday (May 17) at LA's Roxy for Sirius XM's Hits 1 show. He begins his U.S. tour on September 19 in San Francisco. His self-titled first solo album is currently number one on the U.K.'s album chart. It is expected to top the Billboard 200 album chart when new figures are announced on Sunday.